Each academic year, a number of Hope faculty take sabbatical leaves away from the college, submersing themselves for extended periods of time into their favored fields of inquiry. If viewed from above and all together, those fields would look like a calico landscape, so varied and colorful is the topography of their collective research, writing, and creative pursuits. Offering both restoration and adventure, sabbaticals are a bit like information and imagination transfusions. These breaks away from normal classroom and committee work give Hope academicians a boost to reinforce and revitalize their teaching and scholarship. Scientists have been searching for alternative energy sources for years, ones that are more environmentally plentiful and safe. While we tend to think first of wind and solar energy as those natural and prudent ways to power our world, Dr. Jennifer Hampton’s sabbatical research reminds us that other Earth-abundant materials – such as sodium or potassium – have the potential to help with energy usage and storage, too. Dr. Jenny Hampton, associate professor of physics, stands beside a monitor in her lab that displays charging and discharging waves of new materials that hopefully will one day provide energy storage. At the Energy Materials Center (EMC2) at Cornell University last year as a visiting scientist, Hampton went back home in a way to help discover new energy materials and methodology. It was at Cornell where she completed her PhD in 2002, and at EMC2 where her doctoral advisor, Hector Abruña, still conducts research. There once again, Hampton dedicated a year’s worth of her own research – interdisciplinary in nature as it combines physics, chemistry and engineering – to answering these decades-old questions: What can work as energy and how can it be stored? Hampton is hoping to find ways to optimize cheap, bountiful materials for particular applications that could affect consumer electronics, transportation and even power grids. The goal of Hampton and her students is to look at a new type of material that has potential for use in energy storage (batteries). The class of materials is called metal hexacyanoferrates and these materials have open pores where ions of lithium, sodium, or potassium can go in and out when charging or discharging. Hampton is hoping to find ways to optimize these cheap, bountiful materials for particular applications that could affect consumer electronics, transportation and even power grids. Hampton has a substantial grant pending from the NSF to help answer the “why.” (She was also the recipient of two previous National Science Foundation (NSF) grants worth almost $400,00 combined.) Once the reason for faster charging with thicker hexacyanoferrate is found, Hampton foresees the energy industry taking that knowledge and continuing on with their own research to build a better battery. Who knows? Maybe the battery that one day powers your car will have its foundations in a Hope College lab. 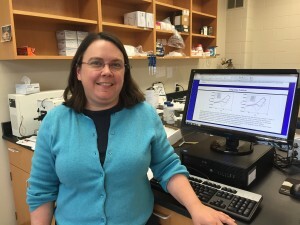 Dr. Jenny Hampton is an associate professor in the Department of Physics at Hope College.